Few books have been written with the extensive research and rigorous scholarship one expects in works that examine the events surrounding the assassination of President John F. Kennedy. This is one of those rare books. With Malice: Lee Harvey Oswald and the Murder of Officer J.D. Tippit is a major contribution to the historical record on the Kennedy assassination and its aftermath. Author Dale K. Myers brings thirty-five years of research to this second-by-second account of the murder of Dallas Patrolman J.D. Tippit - killed forty-five minutes after the assassination of President Kennedy - and the frantic manhunt that ended in the arrest of Lee Harvey Oswald. Although considered the Rosetta Stone of the case against Oswald, the Tippit murder has proven to be one of the most misunderstood, largely ignored - and often twisted - aspects of the Kennedy assassination. For five decades, a community of doubters found reason to challenge the official version of Tippit's death. Eyewitness accounts of the shooting were contorted to exonerate Oswald. Dallas police officers were painted as bumbling flatfoots, not to be trusted. Every government report was assumed to be full of lies and deception. Some claimed that Oswald had been framed by a zealous police force. Others suggested that Tippit was part of the plot to murder the chief executive. There have been many questions raised about Tippit's death over the past fifty years, but few real attempts to find the answers. With Malice weaves first hand accounts (many taken from personal interviews), newly released documents, and previously unpublished photographs into a detailed tapestry of facts that lifts the mystery surrounding this pivotal moment in American history. Did Oswald murder Tippit? Was Tippit a part of the plot to murder President Kennedy? What really happened on Tenth Street? Fully documented and richly illustrated, With Malice fills a major void in Kennedy assassination literature. Myers' painstaking research and analysis is fresh, innovative, and thought provoking. Rarely has one book brought together original elements from so many far flung sources - the National Archives, Texas State Archives, and the Dallas Municipal Archives and Records Center, as well as the personal accounts of family members, eyewitnesses, police officers, newsmen, and investigators. This is their story, in their own words. 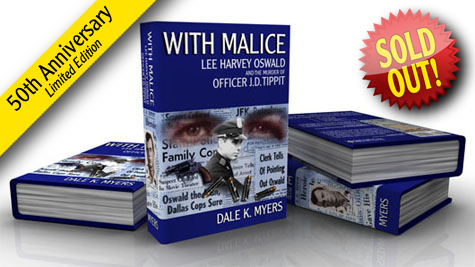 With Malice: Lee Harvey Oswald and the Murder of Officer J.D. Tippit, by Dale K. Myers, is the definitive work on the Tippit murder and its far reaching implications.